The new year has brought more normal wintry conditions. Colder temperatures and grey skies dominate our weather. As mentioned in my previous issue my hiking partner and long time friend David Farmer passed away this past December. You will find his smiling face often in the updates these past few years. You will find more in A Tribute To My Friend David. We had a chance to get out and visit the Cedar Glade Picnic Area. My older sister returns for a fall visit in Relatively Speaking: A Visit From My Sister. Please note that most all of the pictures on this site are thumbnails (except slide shows) so you can click on them and get a bigger image. Situated mainly within three states, the 60,000 square mile Ozark Plateau stretches from eastern Oklahoma to southern Missouri to northern Arkansas. The Ozark Mountains, rising to a height of 2,560 feet in Arkansas' Boston Mountains, represent the largest area of highlands between the Appalachians and the Rockies. These rolling hills and low mountains offer rugged terrain, eroded by water from springs and rivers flowing on a journey to the Mississippi River. 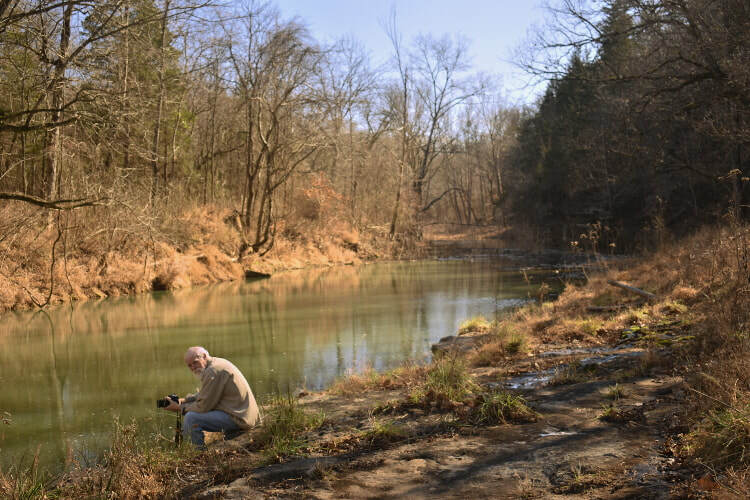 Sparsely populated, the Ozark region is unknown to many people, conjuring up scenes of pioneer cabins among the vast hardwood tree cover, where life takes on a slower pace. It is indeed a place where you can get glimpses of an earlier way of life, but it also holds many beautiful, scenic discoveries within its rolling landscape.